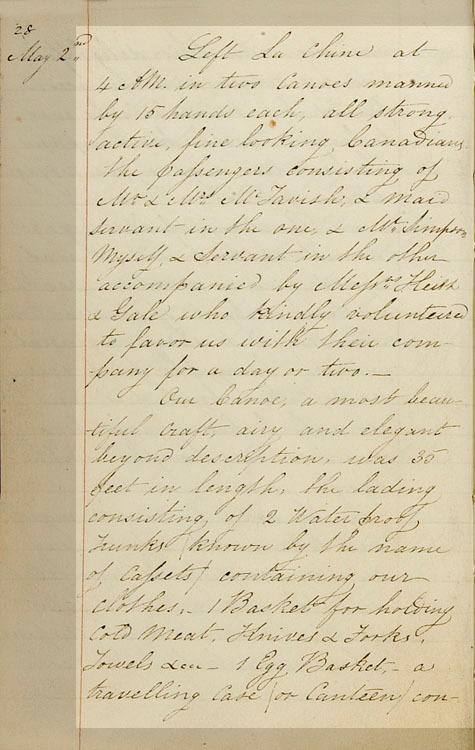 This is the initial entry in the journal kept by Frances during her first canoe trip from Lachine to Red River and beyond in 1830. p50-51, 6th pgh: "May 2nd... state of the weather." “May 2nd Left La Chine at 4 A.M. in two Canoes manned by 15 hands each, all strong active, fine looking Canadians. The passengers consisting of Mr. & Mrs. McTavish, & Maid Servant in the one, & Mr. Simpson Myself & Servant in the other accompanied by Messrs. Keith & Gale who kindly volunteered to favor us with their company for a day or two. The provisions for the Crew were Pork & Biscuits: from which circumstance the young recruits are called “Pork Eaters” to distinguish them from the old Winterers, who feed chiefly on “Pemican,” a mixture of Buffalo Meat, Tallow, and a due proportion of hairs (but whether the last ingredient is intended to keep the composition together or not, I cannot say) this is not the most delicate, but it is very substantial food, and more portable than any other, as it is closely packed in a bag made of Buffalo hide. Frances had been violently seasick during the ocean crossing, but her health improved sufficiently after her arrival in Montreal for her to enjoy the canoe trip from Lachine to York Factory. The two wives were the first British women ever to travel this route. Frances particularly admired the strength and skill of the voyageurs, two of whom were entrusted to carry the ladies over the portages.